When we’re talking about player evaluations, it often seems like we get caught up in the whole black-or-white, he’s-either-good-or-bad-there-is-no-alternative train of thought. While it’s tempting to fall into this, the fact of the matter is that there’s a hell of a lot of grey area when it comes to ranking players because no one really understands exactly how hockey works yet (similarly, no one really understands how gravity works either but that doesn’t stop physicists from creating very accurate and detailed models based on what the best available approximations and theories tell us. This is a long-winded way of saying that Corsi, Fenwick and possession theory are our best available approximations of understanding hockey and yes we totally can accurately analyze hockey with numbers, you guys. But, I digress). Similarly, there’s a ton of grey area when ranking prospects, and perhaps the most contentious ranking we at Canucks Army have had is that of Jake Virtanen. Virtanen has a lot of good things going for him – he led all first-time draft eligible players in even strength goals, possesses a great shot relative to other CHLers, and is by all accounts one of the most “toolsy” players in the draft. In other words, he’s a good NHL prospect. Vancouver, however, would be smart to avoid Virtanen at 6th overall. Read past the jump to find out why. While we can debate the ins-and-outs of whether or not Virtanen’s numbers accurately reflected his play this year (before we continue, it is worth noting that despite a strong record, the Calgary Hitmen were not a very good possession team and a PDO-driven mirage for most of the year, so Virtanen’s offensive numbers being deflated by poor shooting luck seems incredibly unlikely), but we’ll give him the benefit of the doubt here and assume his production is “real.” The point I want to focus on here is the “making safe bets” part. More than anything, a draft pick is a bet. When an NHL team selects a given player, they are essentially saying “we bet that this player holds more future utility to us than any other player we could have selected at this time.” Of course, you can’t know anything for sure with prospects, so this statement carries a lot of uncertainty. Not only that, but selecting a player carries an opportunity cost component that has to be considered. If you’ve never taken an economics course, an opportunity cost is the cost associated with the best available alternative course of action not selected. For example, Vancouver selected Nathan Smith in the first round of the 2000 entry draft. The best available alternative at the time as determined by our “fixed” Sham Sharron model (that we’ll roll out in full before the draft) was Justin Williams. Williams has played 837 career NHL games, carrying a career GVT of 109.7. Following the logic outlined in this Michael Shuckers paper, we can say that from 2000 to 2014, the opportunity cost for selecting Smith over Williams was between $24 million and $37 million. In other words, since Smith provided next to no value in his NHL career, the Vancouver Canucks lost between $24-$36 million in player value because of the decision to draft Nathan Smith. Now, obviously this is an extreme example and quite often the actual value of a drafted player will exceed the opportunity cost associated with the best available alternative, leading to a net benefit for teams. The goal then should be to realize the greatest net benefit possible at each draft position, which is a fancy way of saying that a team should want to draft the guy who’s going to be the best NHLer, regardless of position or organizational needs. What Really is a “Safe” Draft Pick? The multi-million dollar question then is how does an NHL team make the best bets? Which prospects are the “safest” and most likely to make the NHL? Which ones are most likely to be superstar players? To begin to get an answer for this, I’ll direct you to two of my favourite prospect-related posts ever, courtesy of Gabe Desjardins at Arctic Ice Hockey. Part 1 is here, and Part 2 is here. The pattern here is pretty clear: the more points a player scores at their given age, the more likely they are to become an NHLer. The safest bets are simply the guys that score the most. This problem here is that this chart lumps all scorers together indiscriminately. Not all point-per-game players are created equal though. Some guys are 5’9 and never get a real NHL look, either because they don’t possess the tools to translate their junior success to NHL success, or because coaches and GMs are saddled with horrific biases and never give them a fair shot – the reason you believe depends on how cynical you are. The point is we should look at pedigree as well as production to get a true sense of what we can expect from a prospect, given the guys who were regarded as highly as him and produced points at the same level. Overall, that’s not a bad group of names by any stretch. Jeff Carter, Gabriel Landeskog, and Ryan Johansen are all legitimate top-6 if not top-3 NHL forwards and certainly are guys that you want on your team. It’s reasonable then to say that those guys are Virtanen’s ceiling. He has a chance to reach that level if everything goes perfectly and his development isn’t hindered in any way. On the flip side, Virtanen’s very closest comparable is Kyle Beach. There are also guys in this sample like Ryan O’Marra and Alex Picard, and Marc-Antoine Pouliot too – total washouts at the NHL level and complete draft busts. There are about as many of these guys as there are legitimate top-6 forwards, so based on our one year of data, it’s probably equally likely that Virtanen is a total draft bust as it is that Virtanen becomes a top line player. The most probable outcome likely lies somewhere in the middle of the two extremes. Here, it’s Virtanen becoming a guy like Mikkel Boedker or Devin Setoguchi or Wojtek Wolski; a useful middle-6 forward best suited to a complimentary role. Overall, that’s not a bad range of outcomes, and barring the still-young group of Noesen, Danault, Klimchuk, and Puempel all busting, it means that Jake Virtanen is likely going to be a regular NHLer. It’s a horribly boring conclusion to come to, but Virtanen is a good prospect and these are the types of boring, non-committal conclusions you draw from just analyzing good prospects. He may be X, he may be Y.
Ehlers is keeping some pretty elite company. His closest comparable is none other than Steven Stamkos, and his floor appears to be what we can infer is Virtanen’s most likely career outcome: a useful mid-6 complimentary forward like Derrick Brassard. Once again, Ehlers is probably as unlikely to reach John Tavares/Steve Stamkos levels as he is to only perform at his floor level, so we can say that his most likely career path is that of a very good 1st line forward. Another way to look at it is that you have the choice between selecting one random player from Jake Virtanen’s bin or one random player from Nik Ehlers’ bin. If you’re a rational person, you’re going to choose from Ehlers’ bin 10 times out of 10. There’s a larger chance of finding an elite player, a lower chance of finding an outright bust, and the average player you select will be better than the average player from Virtanen’s bin. Because of this, Vancouver should absolutely avoid Virtanen at 6th overall, in favour of Ehlers or Dal Colle or Draisaitl or Bennett or Reinhart if one of them slides. It’s nothing against Jake Virtanen, since he’s still a very good prospect. It’s simply that there will be better bets with less uncertainty attached still on the board. In this exercise, we gave both Ehlers and Virtanen the benefit of the doubt and assumed their draft-year production was “real” and not inflated in any meaningful way. While this may not be true for either player, there is probably more concern surrounding Ehlers than there is Virtanen. While Virtanen did play with a couple of more talented/older offensive players in Greg Chase, Brady Brassart, and Adam Tambellini, Ehlers shared a team with Jonathan Drouin, who is definitely and unquestionably an elite offensive talent. 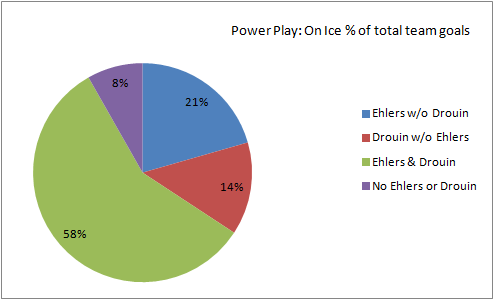 Ehlers totaled 35 powerplay points, 24 with Drouin on the ice. Only Michael Dal Colle (43) and Sam Reinhart (40) were more prolific with the man advantage among draft eligible players. While the presence of Jonathan Drouin more than likely helped Ehlers in some regard, there is no real evidence to suggest that Ehlers’ output is a teammate-driven illusion. He spent minimal time with Drouin at even strength and still finished with an elite point total, and looked more than capable of producing on his own in any situation. All indicators point towards Nikolaj Ehlers being a legitimate top prospect and the best likely available player at 6th overall. yeah it’d be great if you’d stop hyping up Ehlers so he falls to the Leafs. thanks! 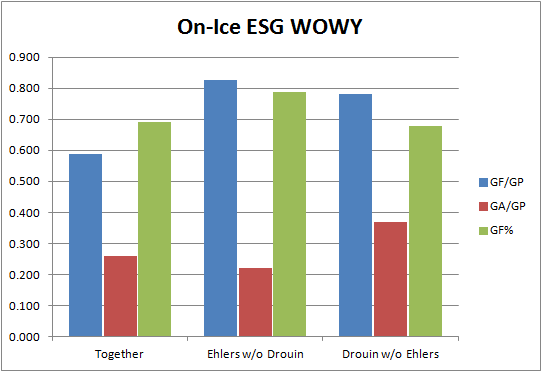 Sorry, but even though ehlers spent 70% of his even strength time without Drouin, what does that mean in terms of QoC? I know Drouin didn’t play the full season because of WJC’s.. and Training Camps etc. but I’m not sure that just because they didn’t play together that means his production did not benefit from playing on the same team as Drouin. 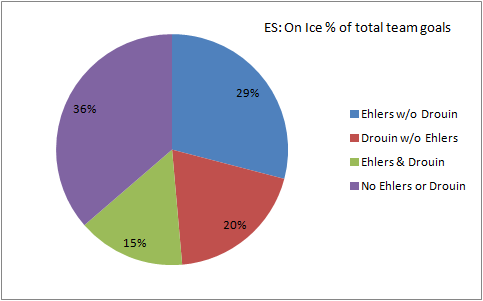 That said I would definately pick Ehlers over Virtanen for the points mentioned in the post. I think it’s better as a comparison point against Drasaitl, Nylander, Bennet, Dal Colle, Reinhart. I don’t disagree with you. In fact, I mentioned that Drouin had to have some effect in the very last paragraph. That being said, the purpose here is to compare two players that will more than likely be available at 6th overall. Sam Bennett, Sam Reinhart, Leon Draisaitl, and Michael Dal Colle are all good bets to be off the board by that point, so it’s not really worth making the comparison of Ehlers to those guys since we care primarily about the guy Vancouver could get. For what it’s worth, I rank Ehlers about the same as Dal Colle, but behind Reinhart, Bennett, and Draisaitl. I’d be interested to see Dal Colle compared. While unlikely, it’s quite possible that NYI drafts Nylander, or Ehlers ahead of Dal Colle. Can you do that comparable? And speaking of which, how do you compare Nylander in that mix. FWIW I did a bit of work on Dal Colle as well. I posted his results in pictures on my twitter feed, but in short he played on a very good line (Scott Laughton & Cole Cassels) and had a mixed impact on ES GF/GA for each player (Cassels benefited, whereas Laughton regressed), so I didn’t really learn much here. More importantly, when playing without Cassels or Laughton, Dal Colle continued to score at the same clip, whereas scoring for Laughton and Cassels dropped of dramatically. Passenger is probably too strong of a characterisation for Laughton and Cassels, but they clearly weren’t the ones driving. Dal Colle looks like he’s going to be a very good player, although I have Ehlers slightly ahead of him. can they draft jordan schroeder again. All problems would be solved. Well you’ve convinced me. Good luck convincing the Canucks. I have wanted Ehlers for months. I’m not opposed to trading up for Reinhart if it’s on the cheap, but Ehlers is who I want. If we take Ritchie or Virtanen I will be crestfallen. Take Virtanen as he played hurt for part of season and he is also youngest of top candidates besides being physical ( has size) the best skater and shot as well by a long shot ! Ehlers reminds was of a player from Oilers in Gagner , but not as good as Gagner down the road . Not sold on Ehlers , and I would not pass on Virtanen for him . Cool to read some of the comments in this oldie goldie. After all the numbers/videos and measurables a are done….. For the first time in a long while I trust the guy making the call on which player has the best chance to become an NHLer. Gillis failed so enormously in the draft because he never had a philosophy. At first it was speed and skill( forget size), then it was bigger late bloomers, then finally drafting OHL and WHL players. Draft positioning played a role, but to not find even bottom 6 or 3rd pairing talent in the first round is unacceptable. Yes Hodgson has been okay, but it looks like Jensen is the best hope after Horvat…. In which he gave up a Very Quality and potentially Allstar quality goalie to draft. Michael Grabner, Cody Hodgson, Niclaus Jensen, Brenden Gaunce, Jordan Schroeder, Bo Horvat and Hunter Shinkaruk aren’t “at least bottom six or 3rd pairing” talent? i’m surprised more ppl don’t comment on the fact he’s a winger and not a C, where Cs are far more valuable. I find the analysis of prospects fascinating and the Sham Sharron article was an eye opener for me. Has anyone tried to communicate these series of analysis articles to the Linden and Benning? I find it alarming that the Canucks have kept their scouting staff, and I would like to know if they are going to incorporate more statistical analysis into their scouting process. Since Linden likes to analyze all the facts, I hope he is reading these articles. Assuming Drouin’s line was matched by the oppositions best defensive pair and centre for most road games where the coach would have last change, wouldn’t Ehlers do better against relatively weaker skaters on the other team? If true, what do these numbers really say about him? I saw him play against the Giants one time. He was pretty much invisible the whole game, but somehow ended up with 3 points by the end of the night. I’d say best case scenario is a Patrick Elias. Definitely not someone who will dominate games, but could collect points and be a solid contributor if put in the right position. I’d like to think the Canucks could do better with the 6th overall pick. I have always figured that if the Canucks want Virtanen that they had best trade for the #10 pick from Anaheim as that seems to me to be closer to where he should go. So, I have never seen him as a part of the equation that this article deals with. That said, I would love to see a three way comparison between Dal Colle, Ehlers and Nylander as it’s pretty likely that any two of these three will be on the board at the number 6 pick, and this is the real choice we’re dealing with. My money’s on Ehlers though. Even if Dal Colle slides, I still prefer Ehlers according to my eye test and my gut feeling towards who they are personality wise. I’d love to see the numbers breakdown too though between these three players, if you have game for it? Sorry for double posting, internet froze. On QoC/QoT for Ehlers vs. Drouin. 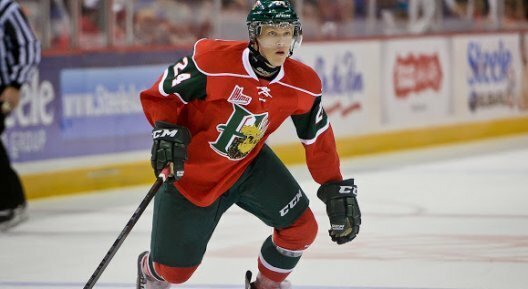 Ehlers faces tougher competition (12.51) vs Drouin (12.37). Ehlers also had weaker teammates (14.26) vs Drouin (14.69). Those QoC/QoT measurements are based on average ES TOI for all opposing skaters. Well snap. Although that’s in line with what I’ve seen before, that Ehlers really is just that good and has only been undervalued because he’s on a team with Drouin.